Ask an Italian for garlic bread and they’ll look at you somewhat quizzically, so it’s little wonder that one of our preferred recipes for a Valoriani wood-fired pizza oven – a wood oven steeped in tradition stretching back to the 19th century – is one for rosemary bread, rather than garlic bread. 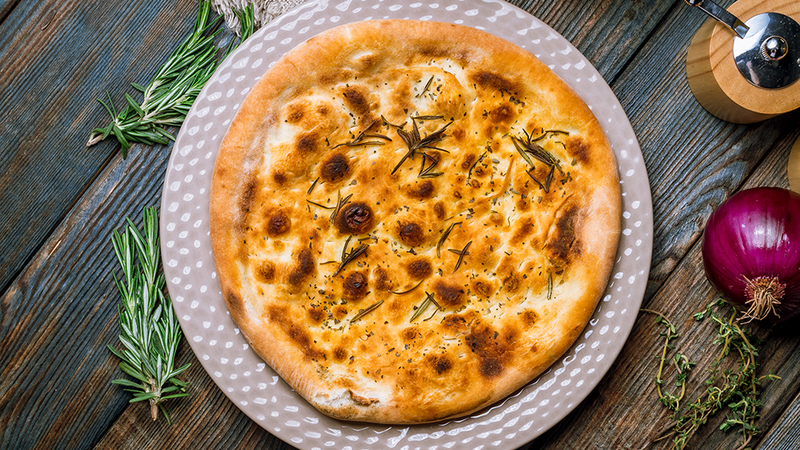 That’s not to say that you can’t knock up a garlic bread, if that’s your preference, but try this recipe at least once and you might just come to appreciate how rosemary – a herb with many health benefits – can bring an astounding taste to your bread. When cooked the wood-fired way, in a superbly manufactured and designed Valoriani wood-fired oven, it really is heaven on earth. The proof of that lies in the fact that Valoriani UK’s Andrew Manciocchi made some rosemary bread in Jamie Oliver’s back garden, when Jamie was having a Valoriani pizza oven fitted. Andrew was cooking this for Gennaro Contaldo and Jamie’s chefs, when Jamie grabbed a piece and wandered to another part of the garden to eat and deconstruct it. He asked Andrew for the recipe and, from that day on, this became Jamie’s go-to pizza at garden shows like the Chelsea Flower Show. As well as having all this chef-lore attached to it, this recipe serves another purpose. It provides you with the methodology to make a fast-cooking, thin bread, which can be a great appetizer before the main foodie event, but also allow you to test that the oven is hot enough to cook pizza. Spread olive oil all over the base, but be careful not to go over the edges, or your pizza will stick to the peel and/or oven floor. Randomly spread the rosermary over the pizza and sprinkle with salt. Place directly on the oven floor at approximately 450ºC-500ºC for 40-80 seconds. Rotate the pizza whilst it is cooking, to cook it evenly. When the oven is at optimum pizza temperature this bread will cook in 40 seconds.